Is our Solar System normal? Or is it weird? How does the Solar System fit within the strange star systems we’ve discovered in the Milky Way so far? With all the beautiful images that come down the pipe from Hubble, our Solar System has been left with celestial body image questions rivaling that of your average teenager. They’re questions we’re all familiar with. Is my posture crooked? Do I look pasty? Are my arms too long? Is it supposed to bulge out like this in the middle? Some of my larger asteroids are slightly asymmetrical. Can everyone tell? And of course the toughest question of all… Am I normal? The idea that stars are suns with planets orbiting them dates back to early human history. This was generally accompanied by the idea that other planetary systems would be much like our own. It’s only in the last few decades that we’ve had real evidence of planets around other stars, known as exoplanets. The first extrasolar planet was discovered around a pulsar in 1992 and the first “hot jupiter” was discovered in 1995. Most of the known exoplanets have been discovered by the amazing Kepler spacecraft. Kepler uses the transit method, observing stars over long periods of time to see if they dim as a planet passes in front of the star. Since then, astronomers have found more than 1700 exoplanets, and 460 stars are known to have multiple planets. Most of these stellar systems are around main sequence stars, just like the Sun. Leaving us with plenty of systems for comparison. So, is our Solar System normal? Planets in a stellar system tend to have roughly circular orbits, just like our Solar system. They have a range of larger and smaller planets, just like ours. Most of the known systems are even around G-type stars. Just like ours.….and we are even starting to find Earth-size planets in the habitable zones of their stars. JUST LIKE OURS! Not so fast…Other stellar systems don’t seem to have the division of small rocky planets closer to the star and larger gas planets farther away. In fact, large Jupiter-type planets are generally found close to the star. 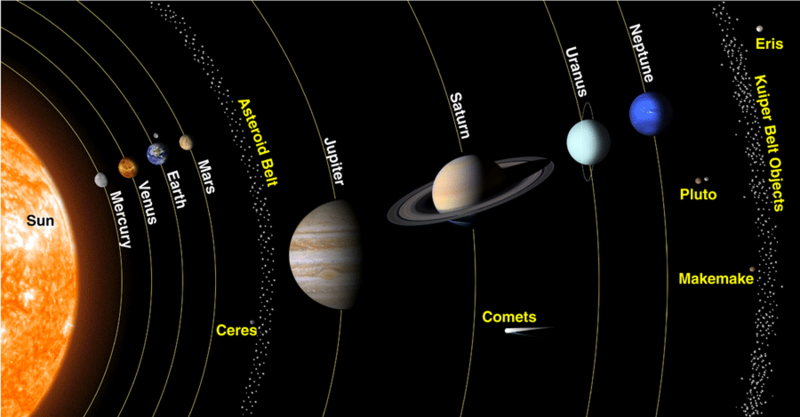 This makes our solar system rather unusual. Computer simulations of early planetary formation shows that large planets tend to move inward toward their star as they form, due to its interaction with the material of the protoplanetary disk. This would imply that large planets are often close to the star, which is what we observe. Large planets in our own system are unusually distant from the Sun because of a gravitational dance between Jupiter and Saturn that happened when our Solar System was young. Although our Solar System is slightly unusual, there are some planetary systems that are downright quirky. There are planetary systems where the orbits are tilted at radically different angles, like Kepler 56, and a sci-fi favorite, the planets that orbit two stars like Kepler 16 and 34. There is even a planet so close to its star that its year lasts only 18 hours, known 55 Cancri e.
And the who knows, maybe we’ll find another planet… just like ours. What say you? Where should we go looking for habitable worlds in this big bad universe of ours? Tell us in the comments. And if you like what you see, come check out our Patreon page and find out how you can get these videos early while helping us bring you more great content! Can we please wait for technological means to detect planetary systems like ours before we say we are abnormal? This. As far as I know, no solar system planet is presently detectable by radial velocity, whereas transits would require an exceptionally improbable alignment and the Kepler mission duration precludes any discovery beyond Earth. I think we should look for habitable planets around M dwarfs, because first they are the most common stars in the universe making up between 70% to 90% of the stars, and second Kepler has shown that 50% to 60% of them have a 0.5 to 1.4 earth radii planets in the so called habitable zone, and the fact that Kepler has also shown that M dwarfs have most of the earth-size planets with an occurrence rate of about 2.01 planets per M Star, with the peck being at 0.8 earth radii. Our Solar System is weird. 1. If the solar system evolved from a nebular cloud, then as the matter that would form the sun collapsed inwards, the angular momentum of the solar system would concentrate in the Sun. The popular college text book “Modern Astrophysics” by Carroll and Ostlie notes that this is not the case. Somehow the angular momentum of the solar system has been dispersed outwards. 2. The discovery of large Jupiter like planets near the mother star caught us by surprise. It was assumed that our inner planets were not gas giants were because the radiant energy from the sun pushed the lighter gasses outwards. Finding large gas giants near their mother star blew that explanation away. So an “After the fact” explanation had to be poised, ie the migrating planet hypothesis. All very iffy stuff highly dependent on specific circumstances. 3. There is also the “Faint young Sun Paradox” that was eloquently described by Carl Sagan. Ok, but if the effect of gravity were more powerful in the past as believed by Dirac and Gamow, then a small proto sun could have evolved, blew up, dispersing the angular momentum outwards, blowing away the outer atmospheres. This would also explain the “metals” we have in our solar system today, and the evidence of Strange Xeon, (an isotope of Xeon only produced within a supernova), as well as the evidence something smashed across our solar system ( the formation of our moon, the odd axial tilt of Uranus, asteroid belt ) An increased effect of gravity in the past would also cause the sun to produce more energy in the past.